As a whole package, if what you’re looking for in a smartwatch is Android Wear that’s heavy on design but not features, the Diesel On Full Guard is ideal. But it’s far from perfect. Android Wear - which is Google's wearable operating system - has something of a complicated history, but after nearly four years in existence the platform is starting to move in the right direction. Which is good news for the future of wearable tech. Rather than traditional tech companies trying their hardest to get a grip on design, fashion brands are taking it on, and it's resulting in some varied and attractive results. Just look at the likes of the Fossil Q series or the latest Michael Kors watches. One of the most recognisable fashion brands, of course, is Diesel. Its latest smartwatches - including the On Full Guard, reviewed here - join those from the like the aforementioned companies, and offer something distinctive looking as part of your fashion wardrobe. But is it a genuinely great smartwatch, or an over-complicated piece of wrist jewellery? Unsurprisingly, the On Full Guard looks very Diesel. That's to say, it's big, bold and has an almost unrestrained look. Its case measures a fairly hefty 48mm x 54mm, which, again, means it's pretty big by smartwatch standards. Some will find it too big, but for us it wasn't too dissimilar to analogue watches we've been used to wearing for some time. This heft is built on a 12mm thick chunk of stainless steel, so feels really solid. Most of this lump of steel on our model was kept to its natural silver colouring, brushed to finish. In contrast, the bold bezel around the screen is black, and has four striking "arms" that reach around the edges. Like the case, it's brushed to finish, apart from a slim polished chamfer on the inside. Interestingly, it's not quite as polished and minimal as a dress watch might be, but you could wear the On Full Guard with most outfits and get away with it. The black and silver colouring is classic enough, and the leather strap is a simple affair. Stitching is colour-matched to the soft-touch leather, while the brushed metal studs at the top of each strap and the clasp matches the body's finish. Despite it not being designed for sports use whatsoever, the On Full Guard is built to survive the elements. With IP67 water and dust resistance, you'll be fine to wear it in virtually any weather. The product name is certainly fitting, then. The right edge of the watch features four physical controls: three buttons and a rotating ring around the middle button. This rotating ring can be used to scroll through your notifications - which can be handy if you're unable to use the touchscreen - but is still a bit fiddly to use given the protruding metal frame. Other button functions are fairly limited. The top button is used for activating the animated effects that you can add to the screen, while the bottom one is a shortcut to get to the app search/download screen. As for the middle button, that's the one standard control across all Android Wear watches. Press it once to go to your installed apps, or go back home if you're in another screen; long-press it to launch Google Assistant for voice control. None of the On Full Guard's buttons feel particularly solid or clicky. The top and bottom ones do have a slight click when pressed, but the middle one is just plain mush. There's no haptic feedback to let your senses know that you have, indeed, pressed it successfully. If there's one element of this Diesel watch's design, it's the charging cable. Similar to the Apple Watch, it's a simple USB cable with a magnetic disc at the end. Only problem is that it feels very cheaply made, and the magnet that holds it to the steel case isn't very strong at all. It was too fiddly to get it aligned and sitting flat and, frankly, it's untidy and doesn't suit this premium-looking watch at all. We'd much rather have a dock/stand-based system like Samsung's Gear lineup, or a cushioned stand similar to what Fossil has offered on its Q watches. On the design side, then, the On Full Guard is a case of form over function. If there's a follow-up model, we'd like to see a much better charging solution, a more clickable middle button and a rotating crown that's much easier to use. Like most of the current crop of Android Wear watches, the On Full Guard's screen is fully round, which is a great thing. We're finally rid of the "flat tyre" that plagued a lot of the older devices, appearing as a black bar across the base of the display. That means the Diesel's screen is properly round, filled with content like a proper watch, with no portion cut off. The screen is easily one of the Diesel watch's best features. With a resolution of 454 x 454 pixels, spread over 1.4-inches of AMOLED, it offers a sharp, colourful and contrastful picture. Diesel makes full use of it too, offering some interesting animation options and very customisable watchfaces, that we'll get to shortly. This isn't a sports watch, or dedicated fitness tracker, which is why you won't find GPS or a heart-rate monitor on board. That makes sense, being a fashion watch, but it does make it less useful than some other devices out there. Given its cost, that might prove to be an oversight on Diesel's behalf. To set itself apart on the software side, Diesel has gone for design customisability. Each of its six built-in watchfaces is fully customisable down to the last detail. You can change the colour and design of the hands, the indexes, backplate, and pretty much every element of the watchface. 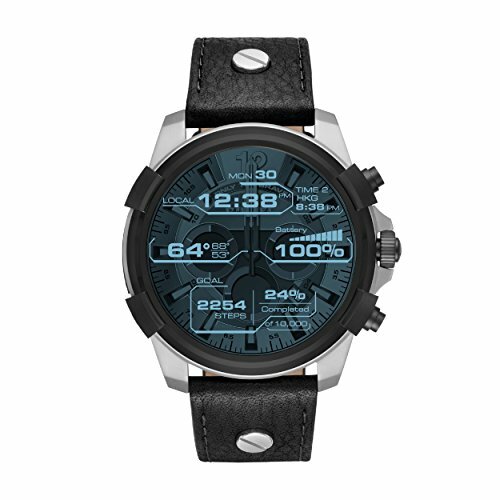 Some of Diesel's watchfaces have secondary visual elements too. There's a HUD mode on one watchface that lets you quickly glance information like the battery level, weather and such by double-tapping a small portion at the top of the screen. You can also activate various animation effects. In these, Diesel has pretty much gone into full-on gimmick mode. There's a weather mode that shows weather animations over the watch face. If it's storming outside, you'll get a lightning bolt across the screen. There's also an activity mode, which is just plain annoying. It covers the screen in virtual dust and only clears when you make your step goal. Do Not Disturb mode is a little more confusing. When activated, digital cracks appear over the screen and increase as more notifications come in. We struggled to like these effects, but some people might like them - each to their own, eh? Being Android Wear also means you can download and install any number of third-party faces from the Google Play Store. So if you'd rather have something more subtle than the design-heavy faces offered by Diesel, you can install those instead. Like a lot of smartwatches these days, the On Full Guard's battery life leaves you wanting. Diesel only promises a day of use from the built-in rechargeable battery, which is pretty accurate to what we found during testing. It is possible to get into a second day, but based on our use, charging at the end of the night became the norm. There was never anywhere near enough battery juice left over at the end of a day to warrant trying to make it through a second day. The lack of staying power from the battery isn't the only reason you'll want to charge it at night. Despite being small, the battery seems to take an age to charge. Plugged in when down to two per cent, for example, it took well over an hour just to get to the 50 per cent mark. That means, if you did somehow get to about lunch time on a second day before it needed charging, you'll likely need the rest of the afternoon to get it fully charged again. Battery and charging performance weren't the only issues we faced. We also had some connectivity issues. When attempting to test the Diesel with an iPhone, it failed to connect in the initial setup. We had similar issues with some Android devices lying around. For instance, we got the watch successfully paired with a Google Pixel 2, a BlackBerry Motion, and a OnePlus 5T - but failed with a different 5T and an Xperia Compact. In short, it's hit and miss. But it's far from perfect. Battery life and charging times are quite frustrating, there's inconsistent connectivity performance, plus the button design could be rethought for better use. What Diesel gets right in the On Full Guard is its aesthetic appearance. If you're after a fashion watch with some added smarts then that's the real sell here. One of the best smartwatches we've reviewed for Android users isn't actually an Android Wear watch, it's the Samsung Gear S3. Both the Classic and Frontier are really well made, and Samsung's own Tizen software is arguably more intuitive than Android Wear, thanks to that rotating bezel around the display. It's got GPS and a heart-rate monitor too. There are several versions of the Huawei Watch 2, and there are several reasons to think about buying it. Firstly, it's got all the features you'd want from a modern day smart watch, including the option to go completely phone-free with the 4G option. It also costs just £270 for the entry model, and has a two-day battery life. If money's no object, and you don't mind splashing over a grand on a great all-round smartwatch, look no further than the Tag Heuer Connected Modular 45. It's beautiful, well made, and is one of those few Android Wear watches you actually want to wear.